Environmental action group Surfrider Foundation is promoting the clean up of beaches with a print advertising campaign in France. “Attention sol glissant” is translated in English as “Caution Wet Floor”. The tag line, “300 plages nettoyées, c’est 300 bonnes raisons de nous remercier”, is translated in English as “300 cleaned beaches, 300 good reasons to thank us”. 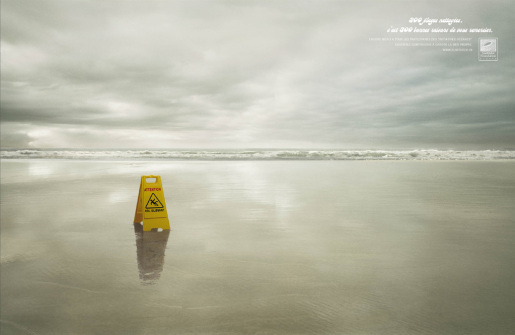 The Cleaned Beaches ad was developed by Les Six at Y&R Paris, Boulogne-Billancourt.